John Granger’s name strikes me as slightly humorous considering his notoriety as a prolifically published Harry Potter aficionado. Like the young lady from the Harry Potter series with whom he shares his last name: Hermione Granger, John came across as witty, insightful, and exceptionally well read. Despite his expertise on the literature of J. K. Rowling, the lecture Mr. Granger gave on Monday April 8, 2013—at the Full Circle Bookstore in Oklahoma City—was concerned with the work of another literary giant: Clive Staples Lewis. The speech—entitled Literary Alchemy in C.S. 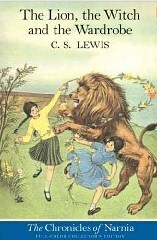 Lewis’ The Lion, the Witch, and the Wardrobe—was part of a lecture series focusing on the Chronicles of Narnia novels. No introduction was given for John Granger who was quite capable of doing so himself. 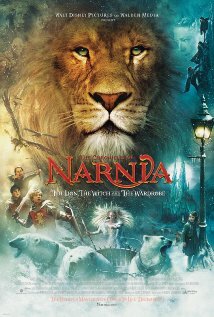 The honors graduate from the University of Chicago qualified himself to discuss the Chronicles of Narnia. 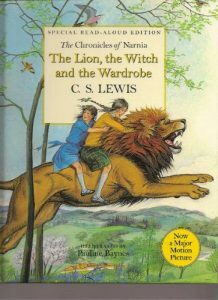 His love and deep appreciation for the fantasy series had led to his developing an interest in, and eventually a devoted study of, the Harry Potter book series. He stood in dress-shirt and slacks with an apropos bowtie at his neck. Deliberately he introduced the main points of his speech to a sparse audience consisting of: Lewis fans and scholars, an employee of the Full Circle, a man recording an audio track of the lecture, John’s wife manning a video camera, and myself. To his right was a laptop on which he had compiled a PowerPoint. 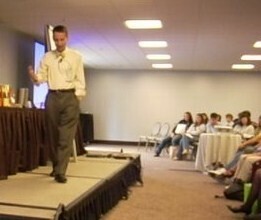 The presentation streamed to a flat screen video display. 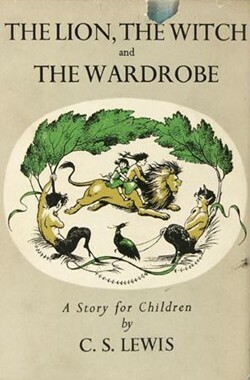 Mr. Granger concluded the introduction of his speech with a list of the topics he intended to cover in the body of his lecture: an explanation of literary alchemy, an explanation of astrological symbolism, specific elements of both alchemy and astrology in The Lion, the Witch, and the Wardrobe, and finally how these topics apply to the audience. With a cavalier attitude John Granger dove into the meat of his speech—beginning with a history and informative discourse on alchemy. One by one Mr. Granger thoroughly covered each main point in the body of his speech. His principal ideas cascaded into detailed discussions of the specifics regarding each topic he chose to highlight. Along the multitudinous paths through which the lecture wound were scattered a plethora of quotes and a couple of anecdotes providing support to the sub-points of the speech. Of course many literary quotes—and even the speaker’s own diction—contained terminology that was technical and went over my head. I was relieved therefore that in each instance Mr. Granger took special care to clarify—often with a definition or description—the words and terms, immediately after he used them. Of particular effect was the speaker’s insistence upon not only orally citing the works from which he derived his supporting quotations, but also having the published literature on hand to display, read from, and recommend as further reference. John Grainger also made effective use of his PowerPoint presentation as a means to display the bullet-points he was expanding upon, include interesting pictures, and—toward the end of the speech—diagram the concept of the Ring Composition of Chiasmus. As he stood at the lectern and divulged the wealth of information he had mined from detailed research into the topics he was presenting, John Granger displayed a series of behaviors that served to enrich his discourse. Principal among these was his maintenance of eye contact with his audience—broken only when reading from his supporting literature. This consistency of eye contact with the audience expanded John’s ethos exponentially; it served to distinguish him as not only extremely well prepared for his speech, but also quite knowledgeable concerning the topic on which he spoke. His verbal acuity with regard to the information he conveyed was also of particular effect. As previously inferred, the language John Granger used in his speech was appropriate only amongst a group of scholars. Within this group however, his tone was not pedantic but rather conversational. His discussion was far less a monotonous classroom lecture and more a lively, fluid presentation of great interest to his audience. He varied the tonal quality of his voice and exuded an exuberance that transferred sufficient energy to endure sitting for the hour duration of the lecture. Overall, I highly enjoyed attending Mr. Granger’s discussion. His topic was of particular interest to myself, as it revolved around alchemical symbolism in literature and the focus of my studies is in chemistry. As Mr. Granger pointed out in his speech, chemistry and alchemy are rather less related than an etymological analysis might claim. However the concept of the transformation of the reader of alchemically structured literature, through the enlightenment of the characters in the work, was thoroughly interesting to me. The other audience members of Mr. Granger’s speech were equally engaged, as evidenced by their enthusiasm to pick the speaker’s brain regarding topics that had piqued their interest. The most useful habits I wish to adopt from Mr. Granger’s method of public speaking include: his level of confidence, his effective use of visual aids, and his audience centered delivery. Mr. Granger projects an attitude of comfort when speaking in front of a group of people. He maintains a collection of both physical and electronic items to visually enhance his performance. He also takes pains to speak to the level of his audience and maintain their engagement in his discussion. I had indicated to John Granger, before his lecture, that I would be critiquing his speech. Jovially, several times throughout the hour, he personally told me to take note of his lack of organization. Fortunately, this perceived disorder was erroneous. Despite the brief interruption of his cell phone ringing and his rather unorthodox pause to sneeze and blow his nose in a midnight blue handkerchief, his delivery was remarkable. I have sat through many award ceremonies, graduations, lectures, and even a keynote speech by former First Lady Laura Bush. It is with no embellishment that I say that John Granger’s Literary Alchemy in C.S. Lewis’ The Lion, the Witch, and the Wardrobe, was one of the most informative—and enjoyable—public speeches I have attended.